Hello and happy first day of fall! To celebrate the first day of the best season of the year several of us decided to get together and show off our favorite fall colors. The problem is I don't have just one favorite fall color! LOL! 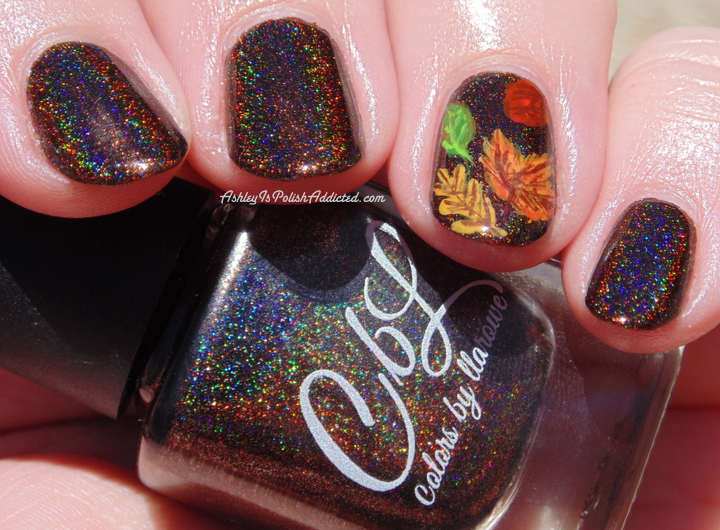 I love rich browns, vampy reds, deep purples and rusty oranges and wear all of them year long, but especially in autumn! I received the fall CbLs that I ordered on Monday (which I had just ordered exactly one week before on pre-order, that's super fast shipping!) and immediately put on Mocha Grande and have not wanted to take it off. It is so beautiful! 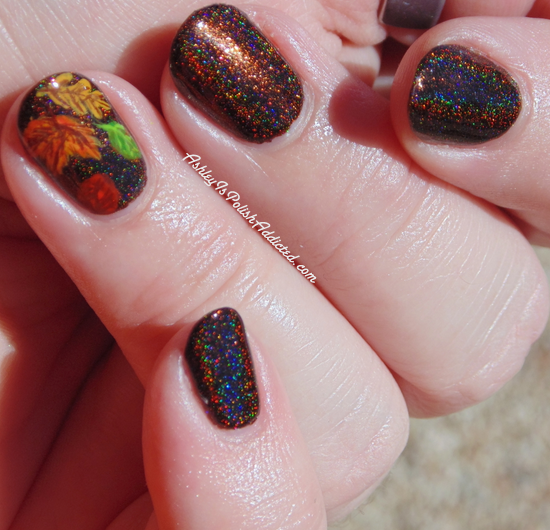 So, I decided I would post it today, along with some autumn nail art. 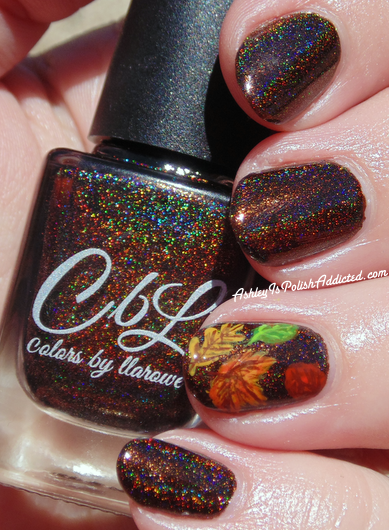 Colors by Llarowe Mocha Grande is a luscious brown linear holo with bronze shimmer. It is beautiful in all lighting and the formula was wonderful. It could easily be a one-coater but I am showing two coats with one coat of top coat. I absolutely love fall, it's my favorite season. 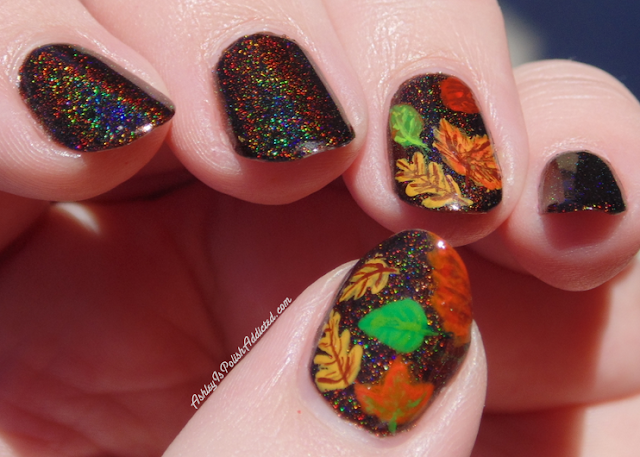 However, living in the desert I don't get to see the gorgeous leaves changing color (or experience many other things that so many people look forward to), so I try to create that feeling in other ways - with decor, clothing and nail art! We are celebrating the first day of fall by having a predicted high of only 99 degrees (fahrenheit) today, though the rest of the week will be around 106 degrees. But I've lived here all my life and this is typical. One day I will live somewhere with four seasons though! To create the leaves I used acrylic paint and a small detail brush. I really love this manicure and don't want to take it off! Make sure you check out all of the amazing fall colors below! Mocha Grande is so beautiful! It's on its way to me now! Mocha Grande is amazing but your beautiful leaves make it come even more alive!